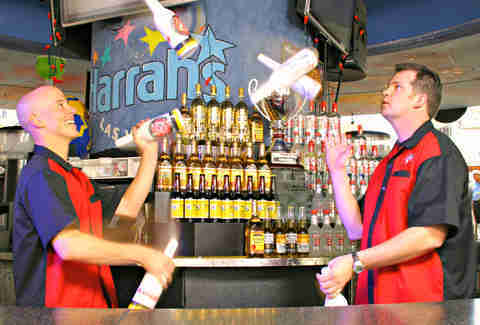 It’s hard to miss Carnaval Court as you stumble along the Strip between Harrah’s and The LINQ. Here, you’ve got an outdoor stage that’s perfect for both DJs and cover bands, as well as a circular bar with bartenders performing bottle tricks that would rival Tom Cruise in Cocktail... if you’re old enough to remember that movie. Need directions to Parasol Down? Just take the escalator from (you guessed it!) Parasol Up and look for the giant decorations hanging from the ceiling. 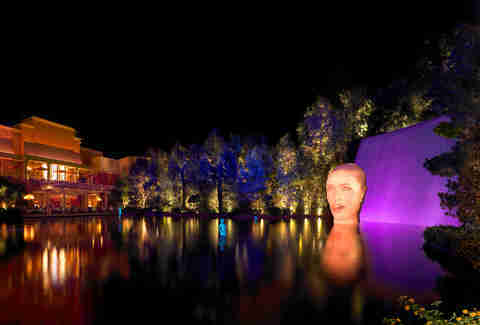 Grab a glass of wine and step outside for an up-close view of the man-made Lake of Dreams without shelling out for dinner at either SW Steakhouse or Lakeside. 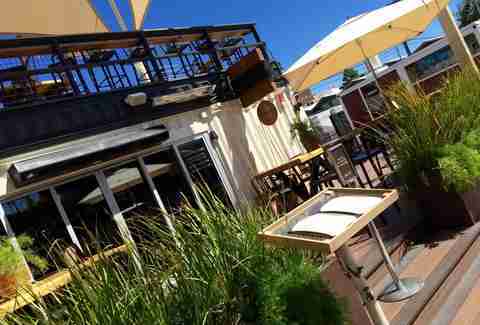 The top choice to grab a drink at the Downtown Container Park specializes in classic cocktails and a more thorough whiskey selection than you’d expect to find in a bar made out of a giant shipping container. Whether you choose a New York Sour or Bulleit rye on the rocks, head upstairs for a sweet view from the roof. It’s best known for its menu of Mexican bar food and Sammy Hagar’s millionaire-making tequila, but the best reason to check out Cabo Wabo could be the sticky-sweet signature Mai Tai. It’s served in a 24oz collector’s glass to make you feel extra touristy while sitting outdoors in a spot where the Strip tends to be the busiest. 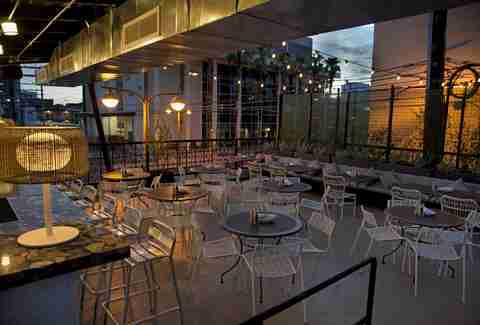 A social spot with a rooftop that’s big enough for benches, couches, and even a dance floor, but cozy enough to encourage conversations among people you only met one drink ago. if you want a little more privacy, there’s always The Laundry Room, a secret speakeasy hidden downtowns. If you have to ask how to get in, you probably aren’t getting in. 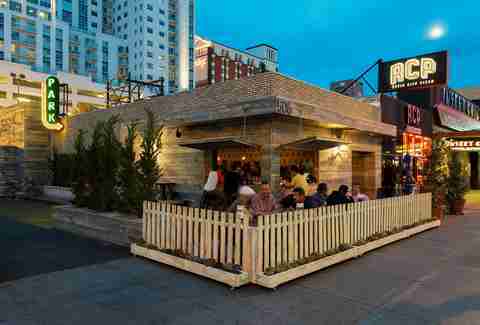 Park on Fremont is usually the first bar you see when entering the Fremont East district from Las Vegas Blvd. In addition to three versions of both the Moscow Mule and Bloody Mary, there are also two options for drinking outdoors. 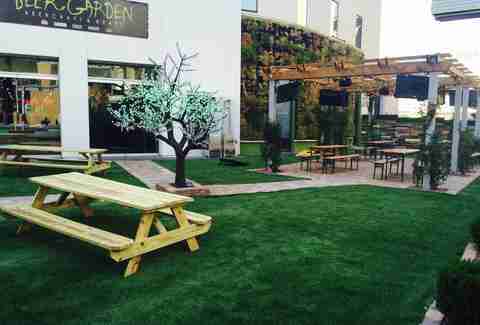 Grab a table in the front or head out back to the courtyard where the atmosphere is a little more lively, and the music is a little bit louder. Wash down the famous Truffle Burger with a cold craft beer, while hanging out on a picnic table under chandeliers that appear to be made from deer antlers. If you need a little more action, head inside to place a bet… where William Hill has set up a sports book inside the restaurant. 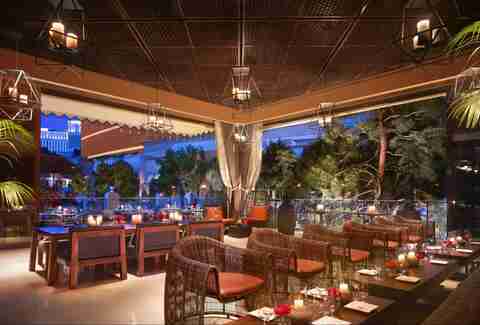 With Rhumbar’s emphasis on cigars and… waitforit!.. rum, it’s almost like it doesn’t matter that we reopened diplomatic relations in Cuba, and truthfully, if you’ve got a spot on the patio and a mojito made with Botran Solera 1893 rum, it doesn’t. Nothing else matters. The best reason to visit Hexx is the in-house chocolate craft program. 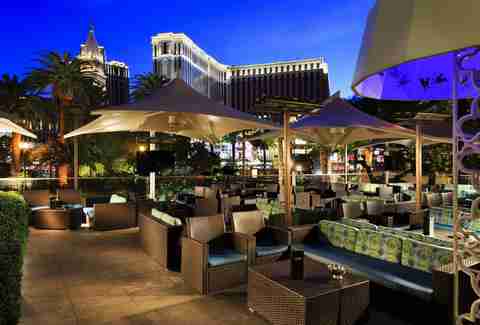 The second-best reason is the patio that spills out onto the Strip directly across from the Bellagio fountains. Pro tip: ask your server for a suggestion from the more-impressive-than-expected wine list. The closest thing to a nightclub Downtown. The dance floor is on the small side, so grab your vodka cranberry and make your way over to the balcony. It’s on the small side as well, but at least you can check out the girls and stare at the nutjobs wandering around on Fremont St. 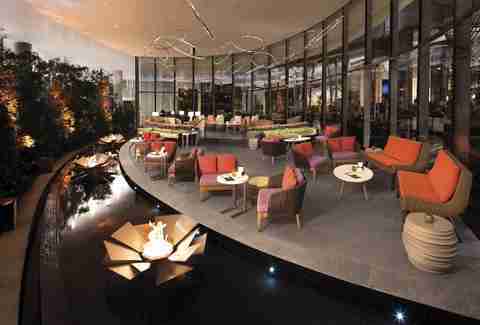 This new hotel lounge comes with a landscaped patio that includes sofa seating, string lights, and fire pits. Take advantage of the flames with a do-it-yourself order of s’mores while sipping on a Tiki cocktail, or one of the wines on tap. 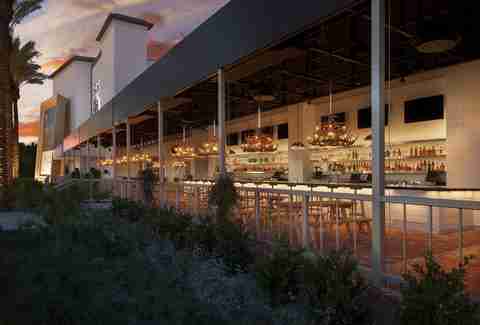 The dining room inside features low lighting to go with the Fettuccine Rustica, and other Italian food, but the outdoor patio has a more energetic side with live music, and misters to keep things cool during the hot summer months. 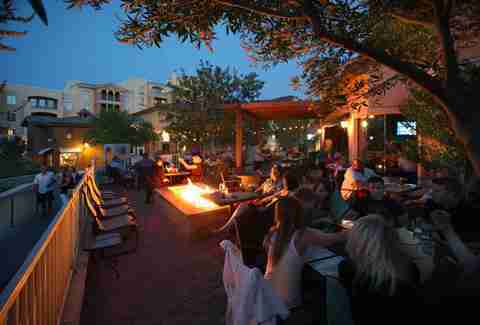 It’s the best place to people-watch at both Tivoli Village and Town Square, especially during $5 martini night on Wednesdays. The 15 best nightclubs in Vegas. Period. If you want to catch your breath after a few minutes (or hours) on the dance floor, just look for the elevator behind the bar at the Chateau nightclub. 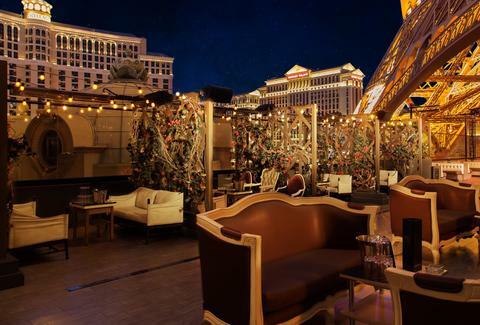 It’ll take you to an outdoor terrace and rooftop patio that’s underneath the Eiffel Tower and overlooks the Bellagio fountains across the street. Take your time before returning inside, ‘cause there are plenty of outdoor bartenders ready to pour a fresh drink or two. 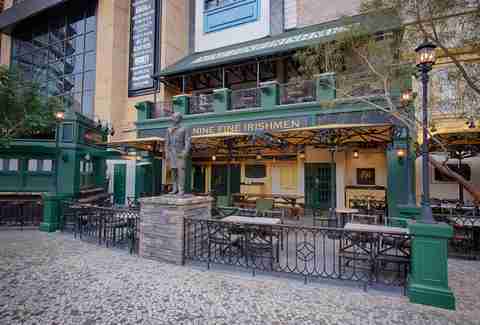 It’s hard to find a more authentic Irish pub… since this one was actually built in Ireland before being shipped over and re-assembled brick by brick in Las Vegas. While it’s tempting to stay indoors with self-serve Guinness taps, there’s also an outdoor walk-up bar that will help you alternate shots of Jameson and Bushmills in the shadow of the Brooklyn Bridge. 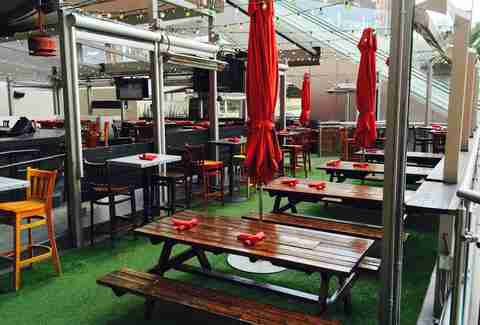 With a recent menu overhaul, renovations, and a name change from “Bier Garten” for Yankees who only speak English, this outdoor drinking spot is one of the few places you’ll find grass (artificial or otherwise) in or around the Fremont Street Experience. There are now 14 choices of bourbon, and new beer bottle selections, to go with the 24 brews on draft, including a few that are rotated out on a regular basis. If you’re hungry, check out the German-inspired snacks like the extra-large pretzel, and six choices of bratwurst. Vice Versa plays off its name with a menu where the “Vice” side includes classic cocktails, and the “Versa” option offers up some more creative (or “twisted”) choices. Whether you go with the Roses are Red sparkling rose cocktail, or the Texas Mule, you’ll enjoy the atmosphere, sitting on comfy chairs, surrounded by fire pits while munching on the lobster tacos. This is possibly the best restaurant to bring your dog to in Las Vegas. The little guy is more than welcome on the patio, where pups are offered bowls of water and their own doggie menus. Humans can choose from local brews on draft, and a diverse menu that includes everything from carne asada to ginger soy salmon. 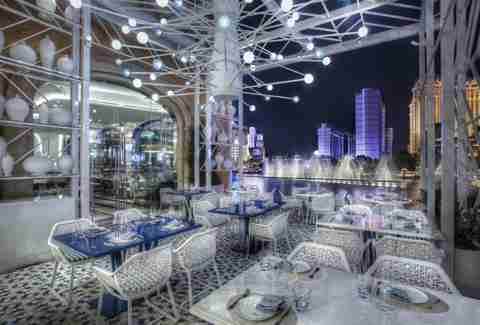 Julian Serrano’s latest Las Vegas restaurant comes with floor-to-ceiling windows that allow you to enjoy the regular Bellagio fountain shows while eating dinner. 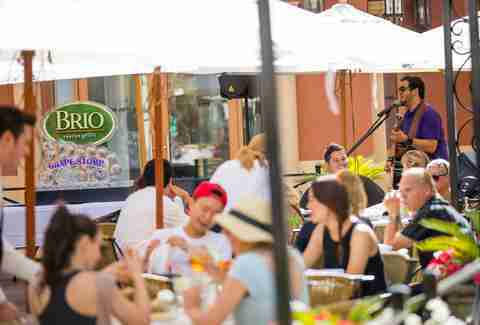 Ask for an outdoor seat where you can wolf down your wine and Spanish tapas... and you may even feel the mist of the water on your face. Lake Las Vegas is a little more quiet these days with the closure of the Montelago casino, but the Sonrisa Grill always seems busy. With more than 60 choices of tequila at the bar, and margaritas that are worth the trip alone, the best part about it is still the outdoor dining area just steps away from a grassy hill that overlooks the lake. 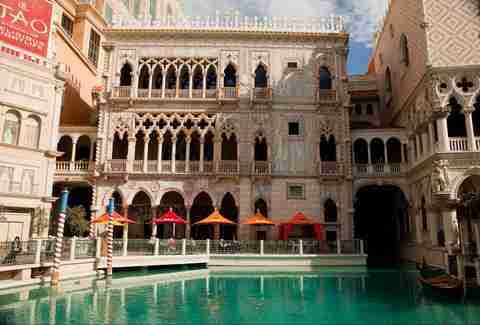 The presence of Mario Batali can be felt throughout the Venetian and Palazzo, but his most casual concept is B&B Burger & Beer. 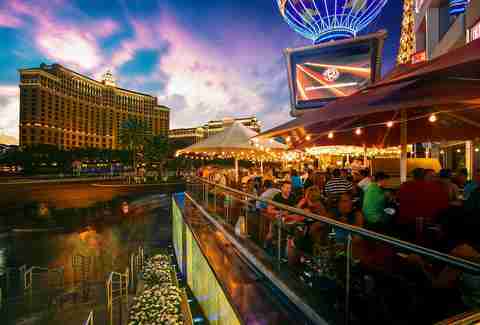 It sits right along the waterway that carries tourists with selfie sticks in gondolas between the two resorts, and boasts a 100-seat patio facing Las Vegas Blvd. The beer list is among the deepest you’ll find at a burger joint, but the cherry milkshake with bourbon could be your best bet. 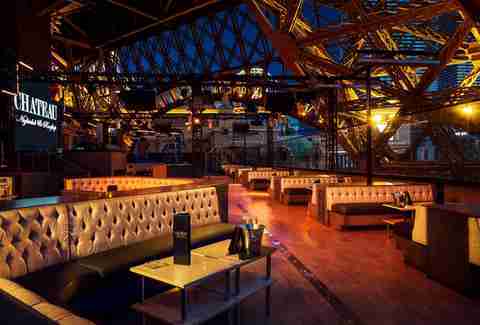 Located on the 55th floor of the Ivory Tower, Ghostbar may offer the best view of the Strip of any place that’s not actually ON the Strip. Plus, with bottle packages beginning at $375, it’s a little easier to party like a VIP without breaking the bank. 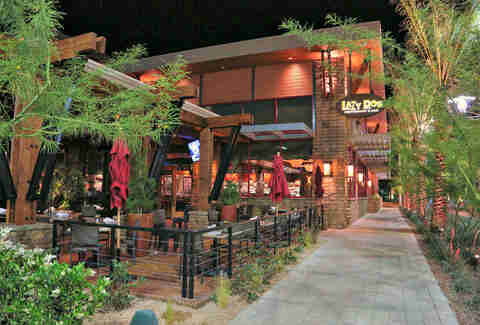 Happy hour is offered daily but runs extra long Monday-Thursday, making the outdoor bar area a prime social destination for locals in the Summerlin area. Check out the deals on beers like Magic Hat and Fat Tire or cocktails like caipirinhas and sangrias. 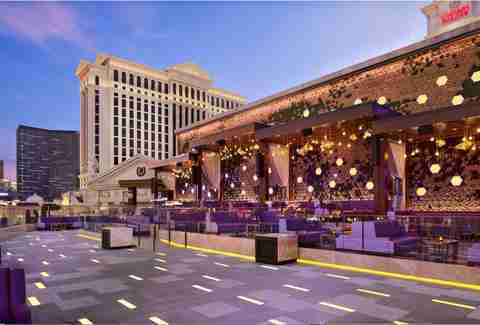 Everyone talks about the freaky chandelier above the dance floor, but the outdoor patio could actually be the coolest thing about the newest nightclub on the Strip. And hey, all things being equal -- the bottle service offers the same fun (and price tag) whether you’re inside or out -- you always go with the rooftop option. 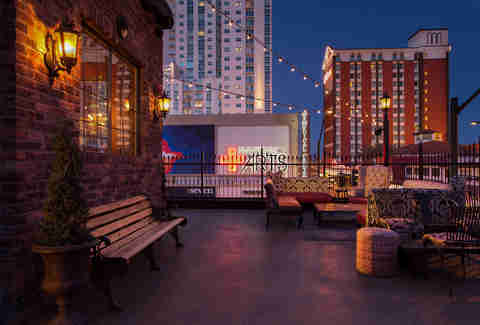 The mechanical bull offers plenty of spectator sport inside, but the outdoor patio is a great spot for enjoying cold beers and cocktails, with down-home comfort food like chicken & waffles and smoked brisket. It was recently renovated to include artificial grass, new lighting, and picnic-style tables, and there are even new shade screens to keep you from passing out due to the Vegas heat. 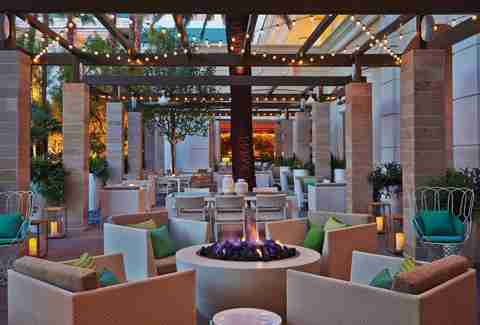 While the dining room can get a bit noisy, the outdoor patio is a surprising change of pace, given its garden setting with candle-lighting, wicker chairs hanging from the ceiling, and wooden rockers overlooking the Wynn pool. The wine list is one of the most impressive on the Strip, so order a bottle to go with the cheese plate made with selections from cow, goat, and sheep’s milk. As possibly the most popular eating destination in the Fremont East area, CK’s main dining room can fill up pretty quick. 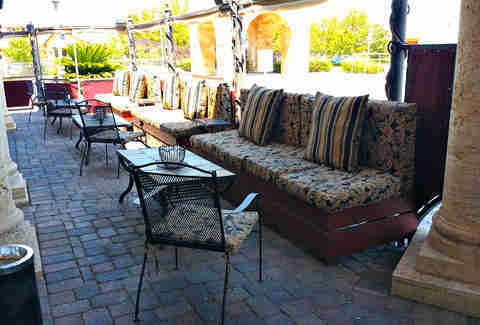 So just head outdoors and sip on a drink in the courtyard while waiting for a table to open up, or head upstairs and enjoy your meal on the roof, which will be easy since the menu was recently updated with fun stuff like wild boar sloppy Joes, bone-in pork belly, and alligator gumbo flatbread. Robert Kachelriess is a freelance writer from Las Vegas whose “work” often involves drinking by pools. Follow him on Twitter @rkacherlriess.